A Victorian village school building has become Upwey's Village Hall. It is a Listed Building with charm and character, nestling in the valley, a stone's throw from the Wishing Well, where the river Wey starts. 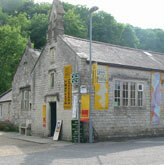 The hall is famous for the creative activities that are hosted there, with many classes and workshops, together with exhibitions and film shows. It is almost unique in having a fully functioning Pottery workshop on the premises, where the Upwey Potters and other local artists and craftspeople teach ceramics and sculpture. The hall is available for private and public functions, both one-off events and as regular bookings. Up to 65 people can be seated for social events and up to 150 with standing room only! There is a full premises licence, including permission for 24 hour a day alcohol retailing, dancing, performances and even mud wrestling! Thanks to the DCA Connecting Dorset scheme, the hall boasts a wireless broadband internet connection and a laptop is available for use by hirers. On the B3159 from Upwey to Martinstown, next door to the Wishing Well Cafe and Water Gardens, which has Brown Signs.